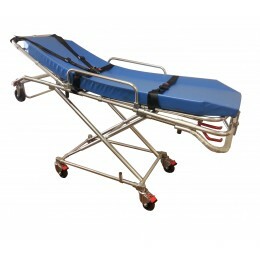 Accommodates various heights for patient transfer. The bed is equipped with a thick, 4 inch foamed cushion with an adjustable back. This stretcher is ideal for inner facility patient use, and for basic stretcher transport operations. It includes a vehicle locking device, and harness securement straps. The castors are all terrain, with wheel locks for added safety.